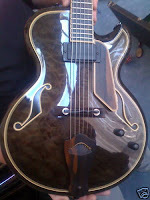 The Guitar Column: Pat Martino's Sakashta Guitar On eBay! 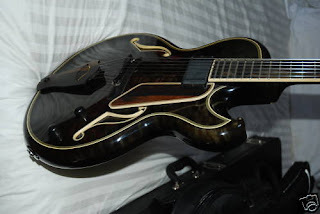 According to the seller this guitar was specially built and presented to Pat Martino by the late guitar maker Taku Sakashta in Japan, presumably before the latter's fateful move to the US. 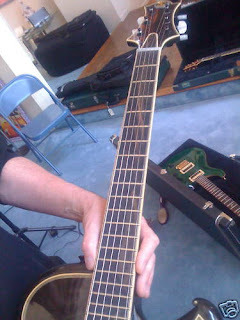 This guitar is Sakashta's R-Style New York model. The R-models feature a unique body construction -- the backs and sides are hand-carved out of a solid piece of wood with an X-braced top added. This 'hollowed-out solidbody' construction facilitates more modern playing styles and amplified tones, resisting feedback at higher volumes, unlike a full-bodied archtop, while retaining some of the acoustic properties of a hollow instrument. The hand-carved sides are beautifully rounded and flow seamlessly into the top, eliminating any square-edges on the body. I can only imagine what holding this guitar feels like! Dubbed the 'Black Jack' this guitar was apparently purchased from Pat along with several of his other personal instruments when he started his endorsement with Gibson Guitars. As always do the necessary research before committing!